Got Lead ! Marketing Machine help you Convert More. What is Digital Marketing Machine ? Digital Marketing Machine is an All-In-One Marketing Automation Software that help you Increase your Coversion Ratio upto 30% in 90 days. Create stunning, beautiful and superfast Websites, Landing Pages, Funnels with easy to use Drag and Drop interface. Nurture Leads and Automate your entire Marketing Process using Email Marketing & easy to use Visual Workflow Builder. Convert more leads into Customers with Sales Automations, Marketing Funnels and Artificial Intelligence. Stop playing merry-go-round for integrating various pieces of software to implement Digital Marketing Strategies. Now with our All-In-One Marketing Automation Software, you can easily create websites, build funnels, create digital vCard, improve SEO and everything to get more website traffic, leads and sales. 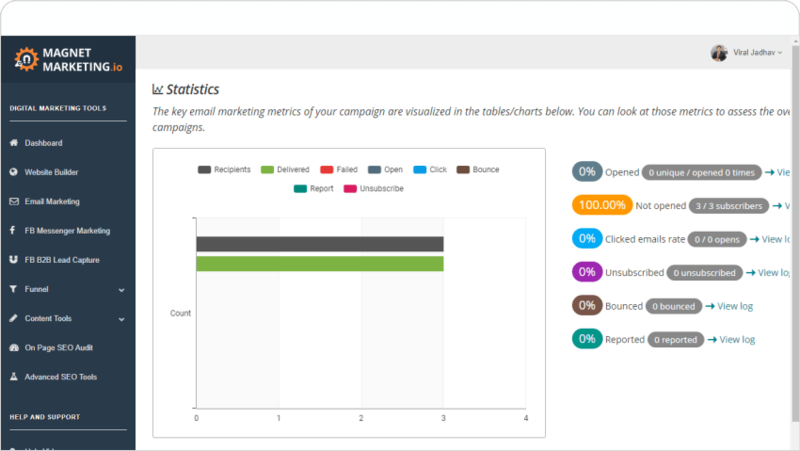 Send Email Marketing Campaigns to your list. Automate email follow-ups with Drip Feature. Capture more Leads by creating Landing Pages. Create from scratch or use our templates. Create automation rules based on user actions, segments, campaigns and, tags. Create a Lead Nurturing Funnel or even a Deep Sales Funnel with multiple upsells. Identify & Convert Hot Leads using our Intell‪igent Scoring and Website Tracking. I was dependent on designer for my landing pages and email marketing. But Digital Marketing Machine really helped me implement my marketing campagins faster and easier. Automation Features also helped me save time and manpower cost.